Many of the photographers we met in Afghanistan used other types of cameras in addition to the kamra-e-faoree. At one point in widespread use in the country were large format film cameras used to take formal portraits. These cameras took black and white photographs, which the photographer often painted over by hand, brush or a combination of both. Below we take a look at large format photography in Afghanistan; a selection of Afghan hand-painted portraits from Afghanistan can be viewed here. The Vageeswari, called the 'Indian camera' in Afghanistan, is an Indian made large format camera. The original British design was produced in different forms and sizes. The ones we encountered were primarily 8x12in, 6.5x15in and 8x15in. The Russian and Japanese lenses used on the cameras are the same as the ones used for the kamra-e-faoree, primarily Congo, Zenit and Yashica. Large format cameras are used for black and white portraits which are often handcoloured. The camera below was given to us as a present by Asad Ullah. Teshakur! In Herat photographers frequently referred to large format cameras as 'Fanus' cameras - fanus means 'lantern' in Farsi. In the Elias Photo Studio, the sons of the owner, Javid, Elias and Ismail, (pictured at the top of this page) showed us a Herati made large format camera that they stopped using nine years ago. Photographers in Afghanistan frequently referred to sheet film as 'cut film'. Very often they cut the sheet film to the required size. This might be to size 4x3cm for passport prints to as big as 9x6cm for images they would later enlarge. They did not limit themselves to the given film format of the camera as they might use a passport size cut film in a large format camera. Hekmatullah in Herat told us that he used to cut sheet film into the size of a 35mm film in order to save material. Photographers re-sized sheet film for all kinds of cameras, no matter if it were a 35mm Zenit, a medium format Yashica or a large format Vageeswari. Below is a gallery with cut films from Hekmatullah's collection and one (no. 10) from Muhammad, another photographer in Herat. In this film Ahmad Zia Ansari hand-colours a large format black and white portrait in his photo-studio in Mazar-e-Sharif; it lasts approximately 4 mins. The retouching process is a very delicate way of smoothing out uneven skin tones and balancing lighting issues that may have occurred during shooting. The photographer uses a very sharp pencil for the process. The grey of the pencil resembles a light skin tone. 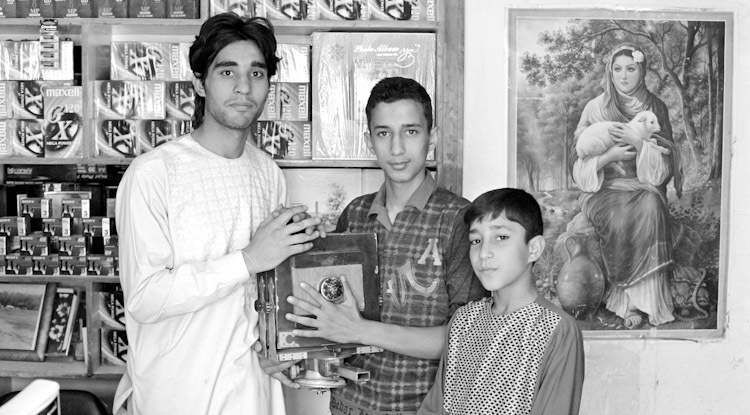 In the clip below Ahmad Zia Ansari 'retouches' a large format negative. In this film Sayed Mahboob prints a positive directly from a large format negative. The process is usually referred to as 'contact printing' as the negative and the photographic paper are in direct contact. For this purpose, Sayed Mahboob constructed an electrical light box containing a red and a white bulb, a contraption he regularly used when printing large format negatives was part of his daily work routine. See how a kamra-e-faoree is used for the same process (without requiring electricity) here. In preparation for their portraits, clients are sometimes set in a pose by the photographer (as opposed to them setting themselves). The photographer, as well as having a prescribed range of positions to choose from, adapts to the moment and his customer. Below, Ahmad Zia Ansari poses a client.